Today we all received a wake-up call at 3:30AM in the morning - OUCH!!! Breakfast was scheduled for 4AM. We were scheduled to leave the hotel at 5AM. Well, we did not accomplish this feat, but left shortly thereafter. We arrived to the Doha airport in time for a 7:30 AM flight. The flight to Muscat, Oman, the capital and largest city in the country of Oman was only a little over an hour, although we lost yet another hour. We were now only eight time zones away from Eastern Standard Daylight Savings time! We did have a small issue at the airport. One of our students happened to be wearing green camouflage pants. When he went through customs he was not allowed to pass through customs unless he removed his pants. The camouflage pants either appeared to be offensive to the culture, or appeared to be military which was not allowed. The student was not given his passport back, until his pants were confiscated. This student went to the private area to remove his pants. He gave his pants to the officers His passport was eventually returned and he was then allowed to enter the country. Just a small story to share with you that we were not in Kansas anymore! We arrived at a very fine hotel in downtown, Muscat. We arrived at approximately 11:30 AM, and had a very quick check-in. Quite atypically, all the rooms were available for the group to check in immediately. I will send photos in next communication of the building. We immediately had a very another buffet meal at the hotel which again allowed us to sample many different types of Omani cuisine. After the lunch, the choir had an hour and half to prepare to leave for a concert at the American School of Muscat. This concert was a 45 minute presentation only for the students for the school. They enthusiastically received us a such way that one may have thought we were rock stars! The school was thoroughly state-of the art. The group's sound blended well. After the concert for the students, we knew that we had a 7PM joint concert this evening with the Muscat Singers, the ONLY choir of this type in Muscat at the American school. We decided to return to the hotel, (15 minute drive back to the hotel where traffic was not nearly the issue as in Doha) to immediately turn-around for a sponsored dinner for the group back at the school. If you are getting dizzy trying to follow this story, imagine how we felt after the jet-lag experience from the initial trip, and waking up at 3:30AM this morning. The meal served at the American School was catered authentic Indian Cuisine. Many students in the group had not ever tasted Indian Cuisine. Although they may have not liked every dish, they appreciated the taste and spicy nature of the food. At 7PM, we started our joint concert with the Muscat singers. 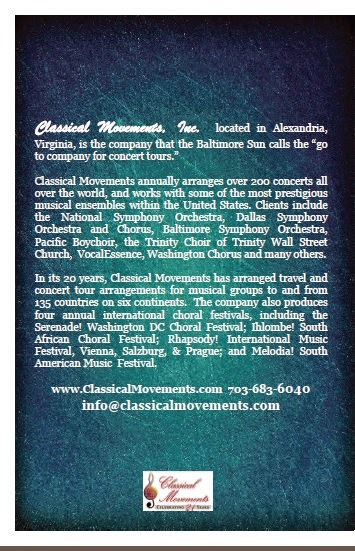 See attached the program that was used for all of concerts. 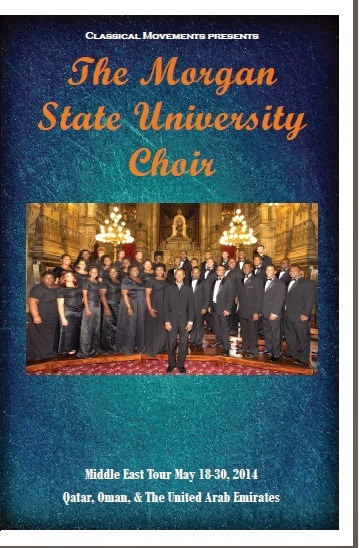 This program booklet contained all music that choir could possibly sing on the tour. Every concert, I announced specifically what was going to be sung. This allowed the group and me the most flexibility in programming. The Muscat Singers opened up with a 20 minute set. We then entered the stage and began to sing our music. This was a great contrast in programming. Although the Muscat Singers performed well, their music or sound was not as engaging or interesting as Morgan's offerings. This concert was the first time that we sang excerpts from Carl Orff's Carmina Burana, the piece that we will sing on the 27th with symphony orchestra in Abu Dhabi, UAE . This was also the first concert that we were bold enough to sing song of our vintage Gospel Music. Being an American School, I believed that this would be well-received here - and I was correct. The crowd immediately got out of their seats and participated in our music. There may have been those in the audience they praised the Nation of Islam, but you would have never have known that from the almost unanimous positive reaction to our music. Our bus drivers who were native to Oman proclaimed that they had just heard the best choir in the world! The Muscat Singers said that they were "profoundly moved by our music". After the concert, the Muscat Singers hosted a reception in our hotel, where wine and cheese were served. The choir had an awesome exchange with the Muscat Singers. One reason for these tours is the cultural exchange. Both groups had a greater appreciation of each other after the concert. See photos attached that may help tell the story.